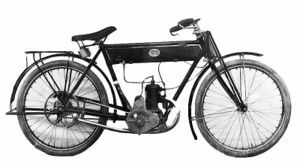 APE (short for Agostinelli Perone) was an Italian motorcycle manufacturer that was active from 1923 to 1925. APE was founded at a mechanic shop in Cyrenaica of Mondavio by Ermanno Agostinelli, and mechanical lathe workshop owner and Luigi Perone, director of the Post Office in Mondavio who was a passionate motorcyclist. The collaboration of Umberto Carloni, a boy and nephew of dell'Agostinelli workshop, which was entrusted the testing of motorcycles, which later gained some notoriety in sports activities in its pilot. In the short two years of operations, the company produced a limited number of cars, versions like ApeSportandApeTourism, with propeller two-stroke to 98cc, built with a French transmission and mounted for the first time on an Italian chassis. There is no evidence that any copy of the APE motorcycles are around today.